A wolf-headed man binds a horse’s leg in this illustration “On Fractures” from a 15th-century copy of the “Hippiatrica”, University of Leiden, VSQ 50, fol. 68r. The Hippiatrica assembles treatments for a wide range of ailments and injuries horses might suffer. The work itself is a collection from various other treatises by authors—e.g., Eumelos, Apsyrtos, Anatolios, Pelagonius, Themnestos, and Hierocles—and was probably assembled sometime between the 5th and the 10th centuries. In this illustration from a 15th-century Italian copy (now in Leiden), a wolf-headed man binds a horse’s fractured leg, the caption says “περὶ κατεαγμάτων” or “On Fractures.” What makes this illustration so amazing is the wolf-like creature caring for the horse. This illustration (like others in the manuscript) closely resembles, in most ways, illustrations in other copies of the Hippiatrica . 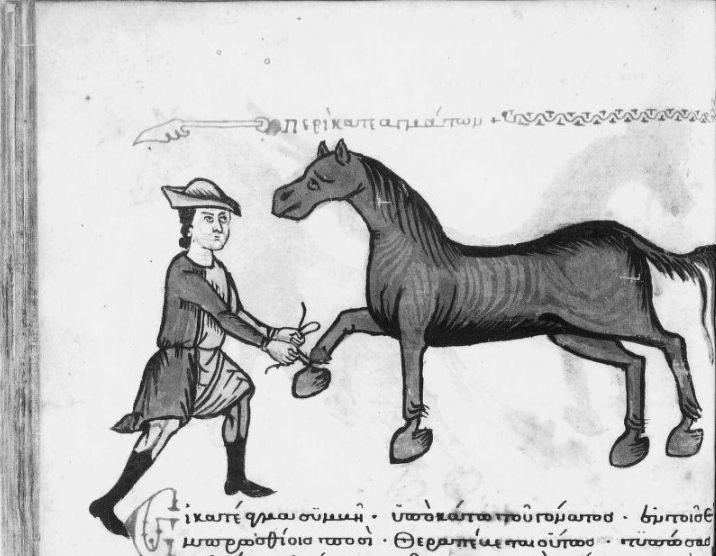 A man binds a horse’s fractured leg in late 14th-century copy of the Hippiatrica , Paris, BN graec. 2244, fol. 36v. But unlike the stern but generally non-threatening looking man in the BN copy, the man (?) in the the Leiden copy is rather scary looking, with his wolf’s head and long tongue threatening the horse. 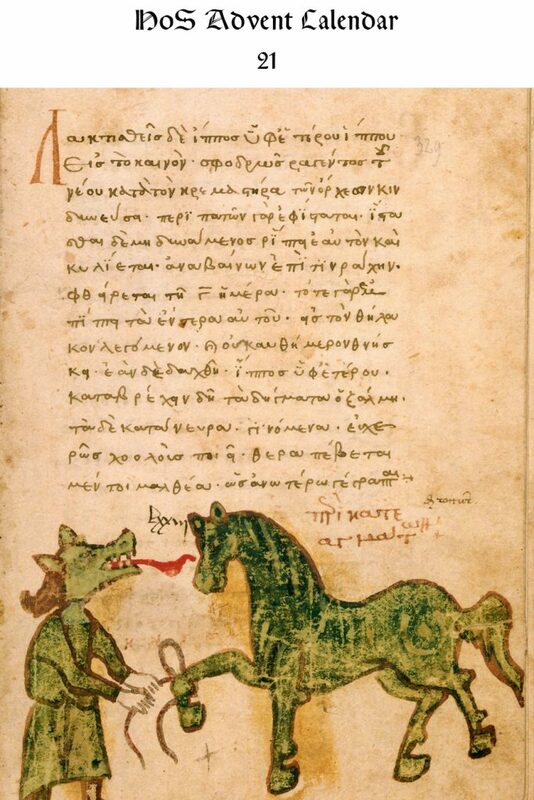 There are other strange creatures depicted in this manuscript caring for horses, such as the footless, dragon-bird monster treating a horse for an ulcer. 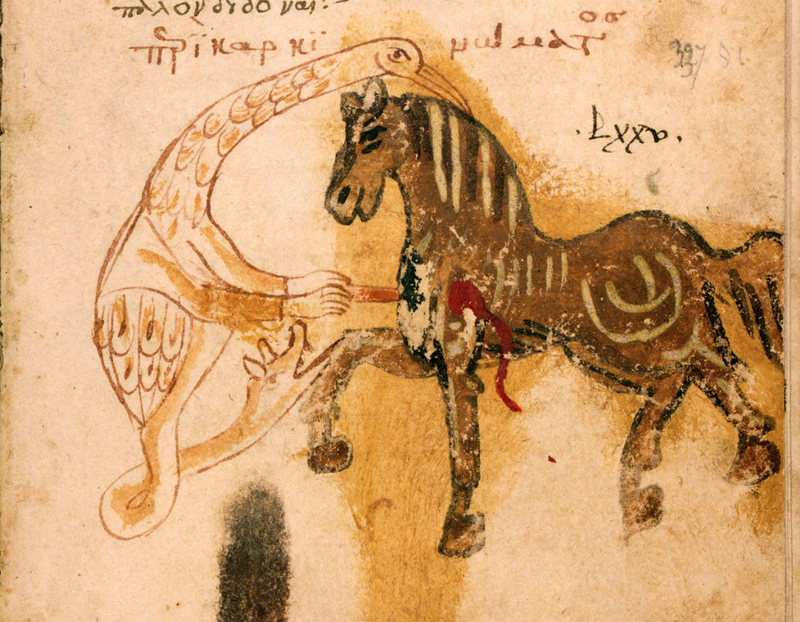 A strange footless, dragon-bird hybrid treats a horse for an ulcer in the chapter “On Ulcers” from a 15th-century copy of the “Hippiatrica”, University of Leiden, VSQ 50, fol. 70r. I know so little about Byzantine veterinary medicine, but am now intrigued. 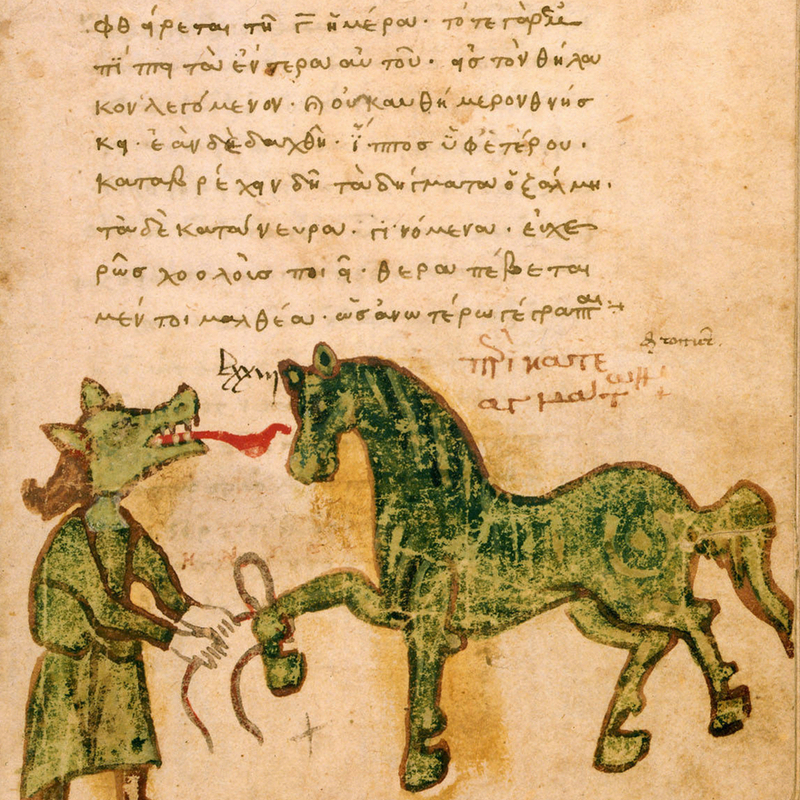 I think I’ve found my holiday reading: Anne Elena McCabe, A Byzantine encyclopaedia of horse medicine (OUP, 2007). Anne Elena McCabe, A Byzantine encyclopaedia of horse medicine (OUP, 2007) looks promising, but sorry OUP, I can’t afford $155 for a book.